I picked these up along with the new Snickers Peanut Caramel Chew that I reviewed Monday. 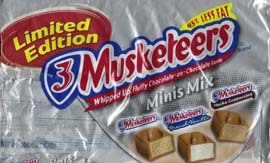 Purchased at Wal-Mart, this bag of Limited Edition 3 Musketeers contains two new flavors: French Vanilla and Mocha Cappuccino. I’m not usually a huge fan of coffee flavored things, be it ice cream, candy or… coffee even, but the Mocha Cappuccino 3 Musketeers isn’t bad at all. It pales in comparison, however, to the delicious vanilla of the new French Vanilla. They are packaged together, so you’ll have to get both (along with the standard flavor), so if you only like vanilla or coffee, I suggest teaming up with a partner that only likes the opposite. Unfortunately, they are only available in the “mini” size, just like the new Snickers. Such a shame too, since I could easily picture myself tearing into a King Size French Vanilla 3 Musketeers. These are still very new, so you may have ahrd time finding them, as they’re not even mentioned on the 3 Musketeers website – but they are worth the hunt. I don’t drink coffee, but I LOVE coffee flavored treats. I am excited to try these! Thanks for telling us about them. I’m in LA and while keeping an eye out for these, I have discovered a conspicuous absence of Three Musketeers candy in general. Target was the only store I was able to even find a bag of regular minuatures. Both the Ralph’s and the Vons I have been to have not even had the bars at the checkout line, and only had the miniatures as found in a mixed bag along with Snickers minis and the like. What’s up west coast?